CHICAGO & NASHVILLE, Tenn.--(BUSINESS WIRE)--GE Healthcare and Vanderbilt University Medical Center (VUMC) today announced a five-year partnership to enable safer and more precise cancer immunotherapies. Multiple diagnostic tools will be developed to help predict both the efficacy of an immunotherapy treatment and its adverse effects for a specific patient before the therapy is administered. This would allow physicians to better target immunotherapies to the right patients and avoid potentially damaging, ineffective and costly courses of treatments. Immunotherapies use the immune system to recognize and attack cancer cells and can be more effective than traditional treatments, but response rates are often low and side effects can be severe1. GE Healthcare and VUMC will retrospectively analyze and correlate the immunotherapy treatment response of thousands of VUMC cancer patients, with their anonymized demographic, genomic, tumor, cellular, proteomic and imaging data. They will then develop AI-powered apps that draw on this data to help physicians identify the most suitable treatment for each individual patient. Simultaneously, GE Healthcare and VUMC will develop new positron-emission tomography (PET) imaging tracers, which together with the apps, will help physicians to stratify cancer patients for clinical trials. It currently takes an average of 12 years2 and costs almost $2bn3 to bring a drug to market. In many cases, inappropriate patients are recruited to participate in immunotherapy trials, incurring unnecessary expense and slowing down approvals of new therapies. It is hoped that the PET tracers will ultimately also be used to monitor the efficacy of immunotherapies in everyday practice. “Immunotherapy offers tremendous promise but given the current unpredictability of some patients’ reactions to treatments, it is also associated with increased morbidity and cost. This partnership provides the opportunity to leverage strengths of both of our organizations to further personalize cancer care by creating new tools that allow clinicians to more accurately predict how patients will respond to a specific therapy,” said Jeff Balser, MD, PhD, President and Chief Executive Officer, Vanderbilt University Medical Center and Dean of the Vanderbilt University School of Medicine. “GE Healthcare and Vanderbilt will combine their data science, genomic, imaging and cellular analysis capabilities to help improve clinical decision making. This partnership is a great example of the increasing convergence of the tools, technologies and data used by therapy innovators and healthcare providers,” said Kieran Murphy, President and Chief Executive Officer, GE Healthcare. 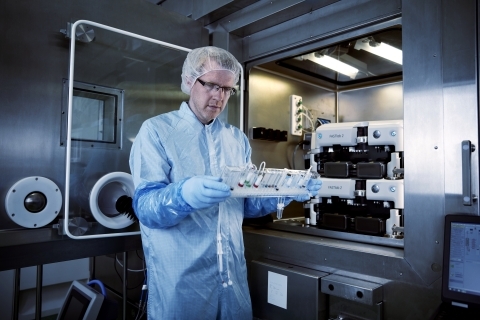 GE Healthcare and the Vanderbilt-Ingram Cancer Center, a world-renowned stem cell transplant facility, will also collaborate on methods to improve productivity, efficiency and cost of stem cell transplant processing operations by automating processes, digitizing workflows, improving throughput and industrializing operations. The first analytics application prototype will be available by the end of 2019 and the PET tracer proof-of-concept by the end of 2020. Vanderbilt University Medical Center (VUMC) is one of the nation’s leading academic medical centers and is the largest comprehensive health system in Tennessee. Its core missions are the delivery of patient care, performing biomedical research and training future leaders in health care. VUMC is the recipient of top accolades by the National Academies, the Magnet Recognition Program, the Leapfrog Group, and has been named a Top Hospital by Truven Health Analytics 14 times. In 2018, U.S. News & World Report named VUMC to the ‘Honor Roll’ of the nation’s top 20 hospitals with 10 nationally-ranked adult specialty programs. In 2018, U.S. News also named the Monroe Carell Jr. Children’s Hospital at Vanderbilt among the nation’s ‘Best Children’s Hospitals’ with 10 out of 10 pediatric specialty programs nationally ranked. For more information and the latest news follow Vanderbilt Health on Facebook, LinkedIn, Twitter, and in the VUMC Reporter. These statements are not guarantees of future performance and undue reliance should not be placed on them.